The things I’m learning working here… the routines, personalities, superstitions and traditions. Starting December 1st, everyone in our building is assigned a day to bring in a treat to share. It’s “technically” called the 12 Days of Christmas but it seems that it’s affectionately referred to as the 12 Pounds of Christmas because it’s hard not to pack on a few extra with all the homemade cookies, candies, crackers and so on that appear every day. Eladia! She brought Bunuelos – a light, flaky cinnamon-sugar dusted confection that must be experienced at least once in everyone’s lifetime. I think I could have eaten my weight in them! So not only do the folks here like to eat – everybody likes to bake and cook! We share recipes as often as we share the names of restaurants and shops with great eats. 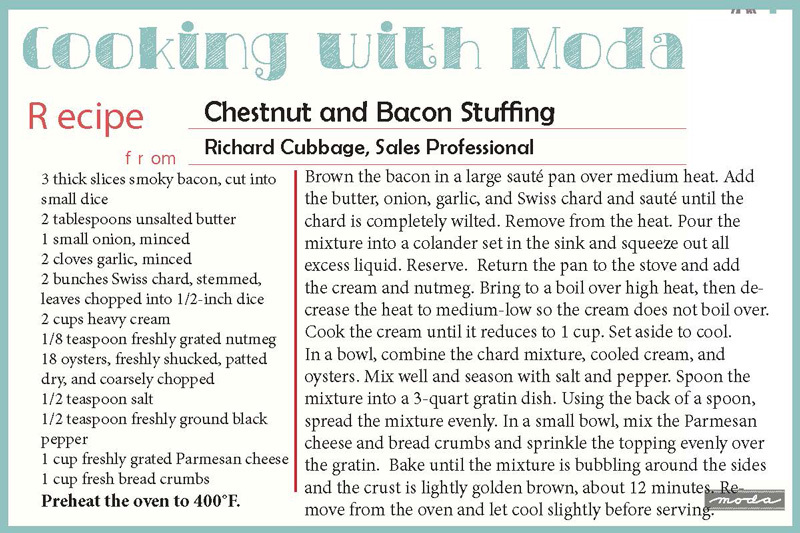 So when Lissa asked at Quilt Market if the Moda Reps had recipes to share, we got recipes and stories! 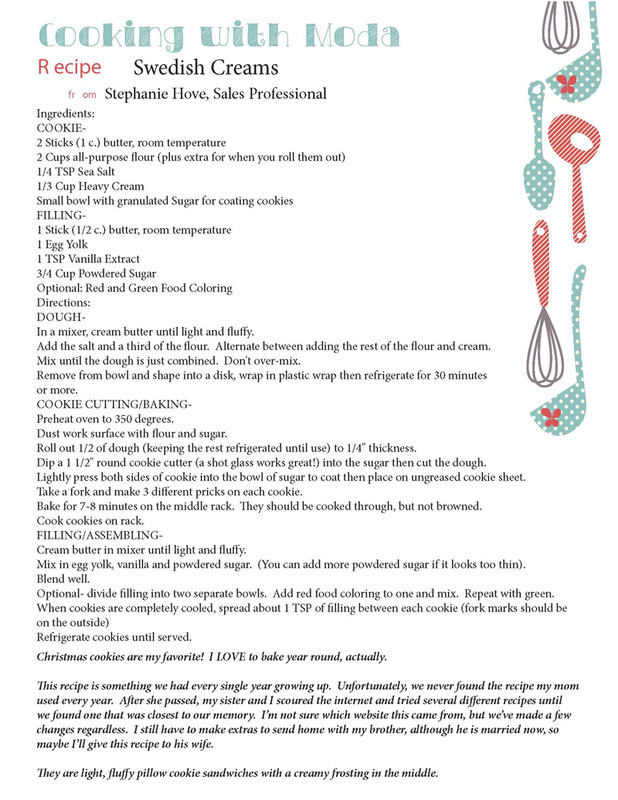 The recipes Lissa collected will be popping up daily on our Facebook page but we wanted to share a few of them here too. A few of the recipes here are a link to a PDF. version. From Richard Cubbage – Oyster Swiss Chard Gratin. In the Cubbage household, oysters are always on hand for the winter holidays – okay, we’re very fond of them in the summer too! I like to plan my sales calls to the Northern Neck of Virginia which is a strip of land bound by the Potomac River to the north and the Rappahannock River to the south between Thanksgiving and Christmas because that’s when I can get a bushel of oysters for what three-dozen oysters would cost at home. Oyster Stew is our tradition for Christmas morning and our dinner always has fried oysters with Virginia Country Ham. This recipe calls for 18 shucked oysters but I always have two-dozen on hand so I can slurp a few raw oysters while I’m shucking the rest for the dish. Fresh oysters in a jar are a good substitute if you live in an area where fresh-in-the-shell oysters are hard to find. My wife, Robyn, would probably divorce me if I didn’t make this every Thanksgiving. Finding Chestnuts can be difficult in some areas, and removing the shells and leathery skin can be just as challenging. Vacuum-packed chestnuts that are already shelled and cleaned are easily found in specialty stores and on the internet. From Stephanie Hove – Swedish Cremes. Christmas cookies are my favorite! I LOVE to bake year-round, actually. This recipe is something we had every year growing up. Unfortunately, we never found the recipe my mom used so after she passed, my sister and I scoured the internet and tried several different recipes until we found one that we thought was closest to our memory. I’m not sure which website this came from, but we’ve made a few changes anyway. I still have to make extras to send home with my brother… although he is married now so maybe I’ll give this recipe to his wife. We always called them “Swedish Creams”. 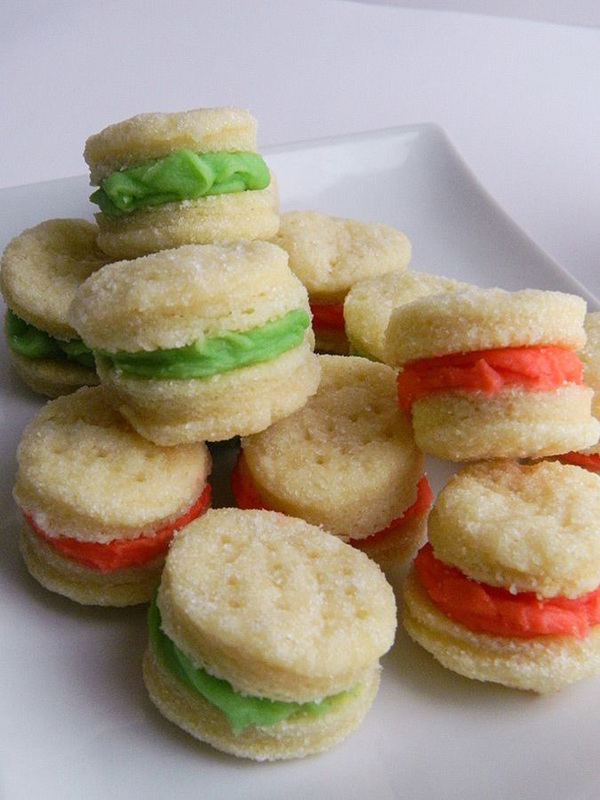 They’re light, fluffy pillow cookie sandwiches with a creamy frosting in the middle. 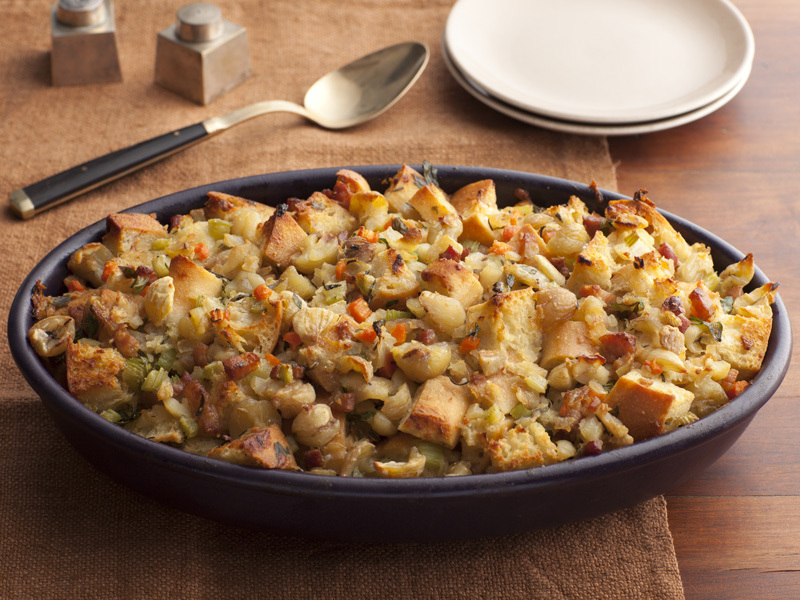 Do you have any family baking-cooking-eating traditions? Many, many years ago, on a whim, my Mom tried a recipe from her Betty Crocker cookbook, circa 1952, for a chiffon-like pie called White Christmas Pie. She liked the name of it, thought it sounded good, so she tried it. It became our Christmas Eve dinner tradition – no matter what we had for dinner, we had that pie with it. Company? She’d make two pies. If we went “out” for dinner to relatives, a restaurant, a holiday party… we’d still come home to this pie. Here is the original recipe – a picture of the page. Thank you Ruby and Dixie! I sure do love this pie. The recipes from Richard Cubbage, though delightful sounding, are misnamed and not what the title’s suggest. Oyster Swiss Chard Gratin is actually a recipe for pecan candy, while the bacon chestnut dressing is the Oyster Swiss Chard Gratin recipe.I wanted to see the bacon chestnut dressing recipe. Is it available? Hi Helen – I’m on the hunt! We’re not sure what happened but we’ll find Richard’s recipe and get it posted. It does sound really good! Hi Carrie! I unashamedly admit that while I read all the recipes, the cookies and pie got my full attention!!!! It is entirely possible that I gained 12 pounds as I read. Sigh. Christmas food. Always my downfall – but glad to hear I’m not alone! I love oysters, so I am hoping you include the recipe. Carrie, I learned to cook from that very cookbook and I still have it! However, we never tried the white holiday pie. Thanks for the blast from the past! I’m busy making Christmas treats, both candy and cookies, but lately I wonder why I do it. Everybody says, “Oh, I’m on a diet.” Maybe next year I’ll respect their diets and bring carrots and celery instead! Then I’ll spend my spare time quilting! Love the Moda family sharing. You guys are the best. Oh my the white Christmas pie was my grandma’s speciality at thanksgiving and Christmas! it has been made every year since I can remember and I am 58! she probably got the reciepe from the same place!!! Best pie ever!! Wow! Is there a Moda cookbook? If not there should be. Just a thought. Our family tradition is homemade salt water taffy. We only made it between Thanksgiving and New Years. It was fun to make because we used a scale to measure the ingredients, corn syrup and sugar to a total of 6 lbs & 1 cup butter and a special secret ingredient. Cook to certain temp, and then send down to the basement where my Dad would cool and pull it on a hay hook mounted to a support beam in the basement. The batch makes about 6.5 lbs of candy. After Dad had pulled it to a pretty white color, it came back to the table to be cut into pieces and wrapped in wax paper. The rule for the little kids and newbies was you had to wrap ten pieces before you could eat one off the table. It was wonderful warm and is about the only way most of my family eats it anymore. We don’t make it very often anymore, maybe once a year when we are all together for the holidays. I know when Dad passed away, we made a batch to set out at the memorial service. It brought back lots of good memories. Love seeing that the swedish cremes are a family tradition for others! We’ve made it for 30+ years for christmas gatherings and holiday tins! It was a recipe passed to me from a friend and has spread far & wide. It is the one cookie that disappears before we start our dessert as the little hands reach under the cover and steal a couple or two when the adults aren’t looking. They are labor intensive but all hands help and we arrive with platters filled! It was a very sad year when I thought we didn’t need them at our gathering and now I wouldn’t dream of leaving them out! Thanks for sharing all the fun recipes! Where’s the recipe for the Bunuelos?! They look so yummy! Eladia’s method is simple – purchased flour tortillas that measure about 7″ to 8″. 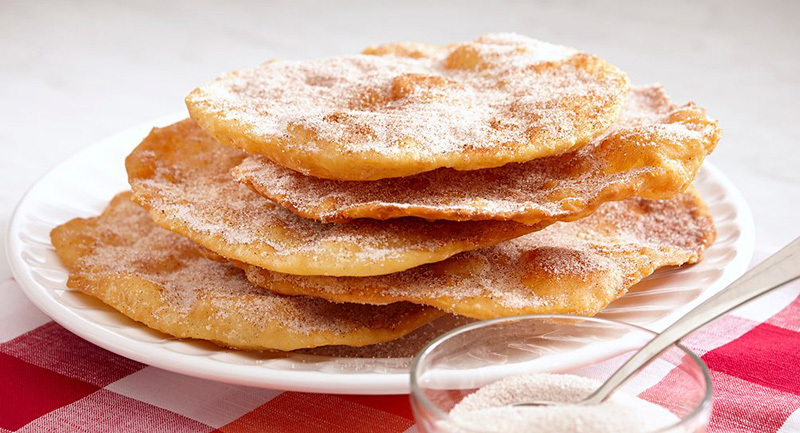 She cuts them into quarters, deep-fries them and sprinkles them with cinnamon-sugar while they’re still warm from frying. We asked Eladia and she said she doesn’t have a printed recipe, it’s that simple. There are two links included here that list the same steps that she uses. 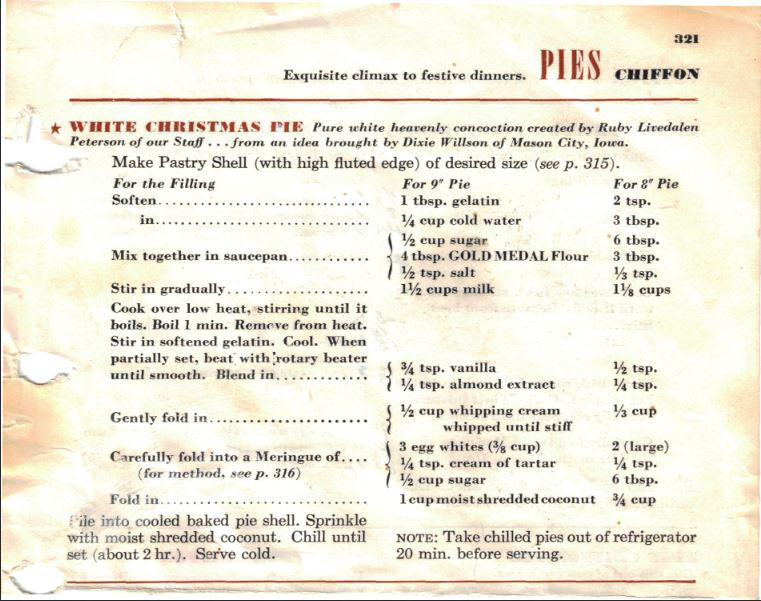 How fun it was to see the recipe for the White Christmas Pie..by Dixie Willson. Dixie, a children’s author, and her brother – Meredith Willson who you may know very well were born and raised in my home town, Mason City, Iowa. While Meredith did not write ‘White Christmas’, he did write ‘It’s Beginning to Look A Lot Like Christmas’. I have lived in Mason City all my life and am proud of the musical heritage we have. Now, I think I will need to make the White Christmas Pie for my Christmas dinner too!